Happy Friday, guys! I have for you today a collection, with swatches, of some of my favourite highlighters/illuminators/luminizers/whatever you want to call them. You may or may not know that I am a total illuminator-fiend. I buy them when I need them, I buy them when I don't need them, and I think no makeup look is complete without them. I am constantly on the lookout for more highlighters, even though my makeup drawers are chock full of them, and I have enough for an entire lifetime's worth of use, and then some. 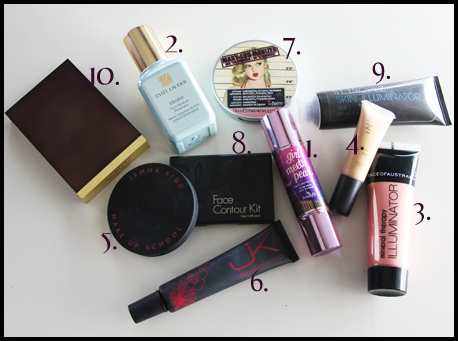 I put together a few of my absolute favourites, for anyone out there looking for a great highlighter. Just for reference, I am between an NC 20 and 25 (I think?). 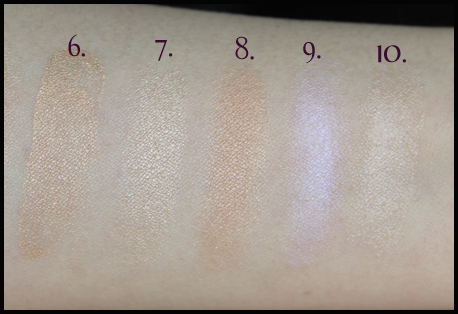 Here are swatches of the various illuminators in natural light, against my skin. The numbers correspond to the numbers on the products in the picture above. As you can see, the most subtle of the highlighters is the Estée Lauder one, followed by the Tom Ford. The Tom Ford is not so much subtle as it is dewy. The effect you get with the Tom Ford one is quite different from all the other highlighters - it adds a beautiful, pearly glow to the face. The product that provides a finish most similar to the Tom Ford highlighter is the Jemma Kidd Dewy Glow. Check out my review of the Tom Ford Shade and Illuminate on ThePlasticDiaries.com! I find the St Tropez illuminator the most unique, but this is more suited to both very light and very dark skin tones (basically very cool skintones). If you're looking for more frosty, glittery illuminators, your go-to products would be the Face of Australia and TheBalm. 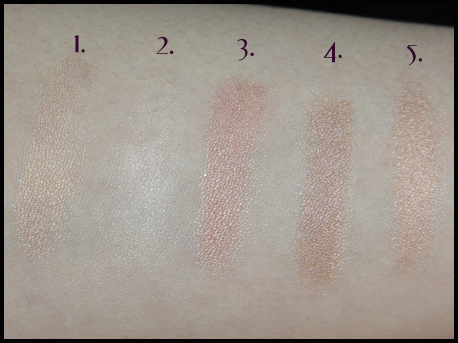 If you're going for finer particles of shimmer for a more subtle glow, I love the INIKA, and the JK Skin Perfector. Most of these products (save for the St Tropez one) match neutral, slightly warm, and very warm skin tones. If you are cool-toned, aside from the obvious St Tropez, I suggest using the Jemma Kidd Dewy Glow, the INIKA, and the Tom Ford, as all these have multi-coloured shimmer that work well on all skin tones. The crème de la crème of this collection have to be the INIKA and the Tom Ford - if I had to give up my entire highlighter collection, I'd hang on to these with much ferocity. They contain multi-coloured shimmer, and make my face light up in a non-glitterbomby-yet-entirely-glam way that I (obviously) can't quite explain. I hope this post has helped anyone looking to get some highlighters. These babies are a must have for party or dinner makeup!